Euroconsult’s newly released report, Prospects for In-Flight Entertainment and Connectivity, expects the global in-flight connectivity market to reach $2.1 billion by 2023. SpaceX president says launch of six Orbcomm satellites unlikely to occur before July 14. SES leans on Europe to meet SpaceX launch prices, and to develop a commercial electric-satellite product, to compete with Boeing and other U.S. providers. U.S. Air Force awards Lockheed Martin GEO 5 and GEO 6 contract for SBIRS geosynchronous earth orbit satellites. The Satellite Broadcasting & Communications Association (SBCA) awarded the organization’s Arthur C. Clarke Award to Joseph P. Clayton, President and CEO of DISH. Dauria Aerospace successfully launched two Perseus M spacecraft into Low Earth Orbit (LEO) on June 19, 2014 aboard a Kosmotras Dnepr rocket. NewSat Limited has secured a US$13.6 million teleport customer contract with an Asian telecommunications company. Australian startup satellite operator NewSat Ltd. has purchased capacity on the Russian Satellite Communications Co.’s Express-AM3 satellite. Newsat is on the shortlist for Satellite Operator of the Year award in the ACOMMS 2014. Satellite Internet of Britain puts forward its solution, partnering with SES, for homes and businesses which cannot benefit from a Fiber-to-the-Cabinet deployment due to their remote locations. Airbus inaugurates its first multi-satellite Direct Receiving Station for Alaskan client GeoNorth, for receiving high-resolution earth imaging data from Spot 5, 6, and soon 7 satellites. Millicom, owner of the Tigo brand, has set its sights on Latin America as a top growth market for satellite pay-TV. ASC Signal Corporation was selected by government and commercial customers to deliver 115 Ka-band gateways and large antennas systems over the course of the past six months. Hughes Network Systems has announced the availability of Hughes Emergency Solutions to help businesses and government offices prepare for the 2014 Atlantic hurricane season. IDC partners with Sony and Vue Entertainment to deliver world first live 4K streamings of FIFA World CupTM matches to cinemas. Predator drone crashes in New Mexico desert near Holloman Air Force base after losing its satellite communications link. World View successfully completed scaled test flight of its high-altitude balloon spaceflight system, breaking the world record for highest parafoil flight in the process. Air Force orders 2 more antimissile satellites from Lockheed Martin for $1.9 Billion. Latest SpaceX delay costing Orbcomm money. Arianespace says lower prices offered for smaller satellites launched on its heavy-lift Ariane rockets in response to SpaceX pricing have already resulted in several new launch contracts. AT&T and DirecTV officials face Congress to defend their proposed merger. UAE Aerospace industry takes giant step forward with plans to launch Yahsat’s third satellite, Al Yah 3, in 2016. Scanning of new area in search for Flight 370 has begun by a commercial vessel under contract from the Australian government, but the search has been complicated by a lack of satellite images. General Dynamics SATCOM Technologies to build and install a 100-ton, 12-meter radio telescope antenna for the new Large Latin American Millimeter Array (LLAMA) observatory. Aerojet Rocketdyne successfully performed a series of hot-fire tests on a Bantam demonstration engine made entirely through additive manufacturing. Brazilian Air Force personnel have completed training in France on operating the South American country’s future military communications satellite. UK based Cobbett Hill Earth Station Boosts Maritime Broadband Services With Upgrade To iDirect Evolution. New Thuraya Top-Up App is the first of its kind and allows users from all over the globe to purchase 20, 50 and 160 unit Thuraya Prepaid airtime vouchers easily and securely. SSTL-built earth observation satellite KazEOSat 2, for Kazakhstan, was successfully launched aboard a Kosmotras Dnepr rocket from Russian launch pad in Yasny on June 19, 2014. Research to shrink GPS electronics could enable hosted GPS satellite transceiver payloads on other satellites, and small, ubiquitous, even wearable GPS navigation devices. AEHF-3 Protected Communications Payload, Built by Northrop Grumman, Completes On Orbit Testing Ahead of Schedule. ViaSat’s Exede service tops FCC Measuring Broadband report for second year. Early bird offer to attend Global MilSatCom in November expires next week, with places for this event extremely limited. Singapore offers incentives to entice space companies – Eutelsat announces expansion plans in Singapore. Intermatica partners with Avanti Communications to extend its European satellite broadband coverage. NorthernAxcess prepares for Iridium GO! release with its own style of branding, and marketing that’s leading the industry. KVH introduces inertial navigation system for battlefield vehicles. Globalstar’s newest satellite hotspot, Sat-Fi, is now available. Kratos Defense & Security Solutions subsidiary SAT Corporation has provided a global satellite operator with Carrier Identification (CID) technology to help identify and mitigate RF interference. Bolivia’s dream – put rural areas on the grid with its own satellite. Hispasat will support communications and broadcasting for Ruta Quetzal 2014, a project which will enable a group of international young adventurers to discover Peru and the pre-Hispanic cultures. KazSat-2 to be using its capacities to the full in 2016. KazSat-3 commissioning to reduce import of telecommunications services by $21.8mln a year. India’s Department of Space urges Antrix Corp to quickly seek out additional transponder capacity for Bharat Sanchar Nigam from global operators to ensure better communications services in strategically located Andaman, Nicobar, and Lakshadweep islands. Gilat utilizes Intelsat satellite services to deliver broadband connectivity to schools and communities in rural Colombia. 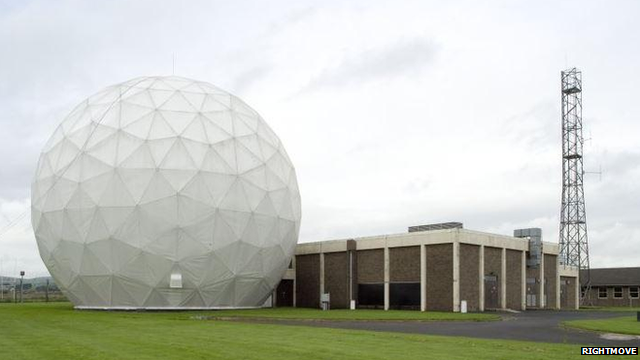 A decommissioned former Nato “golf ball” style communications facility at Balado, near Kinross, is for sale. SpaceX delays launch of six spacecraft for Orbcomm again, to early July, after engineers spot pressure fluctuations in Falcon 9′s second stage booster. Inmarsat endorses GVF certification of satcom operators and installers in support of Global Xpress deployments. NSR’s Global Satellite Capacity Supply and Demand, 11th Edition (GSCSD11) is a comprehensive analysis of the commercial satellite capacity market. NSR’s Commercial Mobility via Satellite, 10th Edition (CMS10) offers a completely updated assessment for all satellite mobility markets around the globe. This entry was posted on Saturday, June 28th, 2014 at 1:47 am	and is filed under Front Page. You can follow any responses to this entry through the RSS 2.0 feed. You can leave a response, or trackback from your own site.